What team features are included in the Pro plan? The Team feature allows you to invite 5 users to your account. Each user will have access to all of the features that the parent account has. To enable the team feature you will need to upgrade to the Pro plan. Then login to your loader account and navigate to the upper right-hand corner where your email address is displayed. 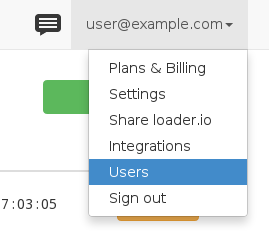 Click on "Users" in the dropdown to manage your users. From here you can invite users via email. Once the confirmation email is triggered by the invited user, he/she will be able to set up loader credentials. If a user already has a loader account, contact the owner and have them remove their account, or use a different email address. How do I delete or remove my account?